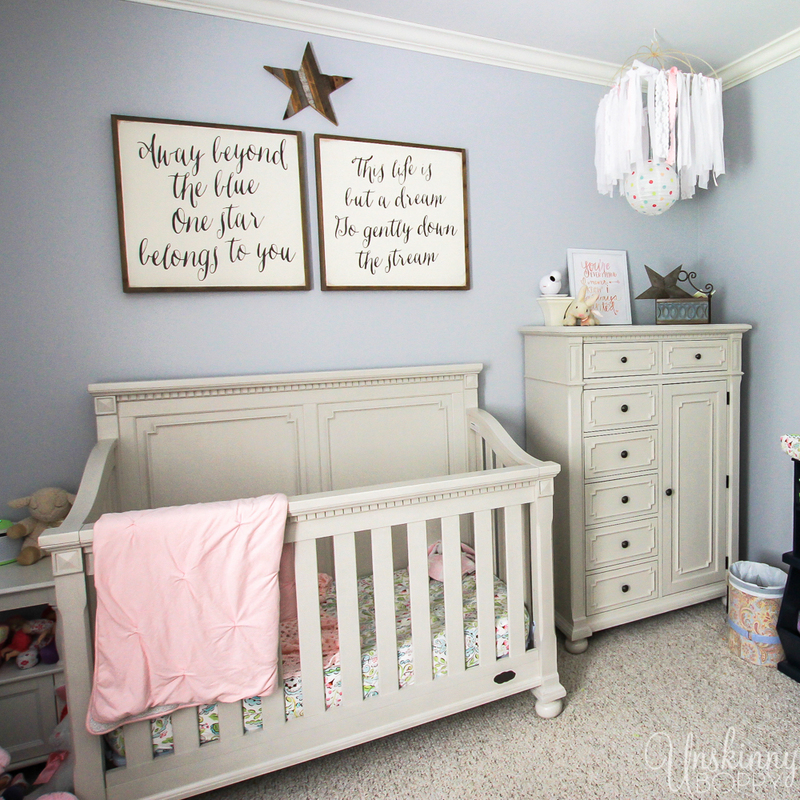 Before she was born we decorated a nursery for Caroline on the second floor, which I blogged about in this post. It was a really pretty room, but she never even stepped foot in there. She slept in our bedroom for the first six months of her life and then we had to make some changes. I knew there was no way I was going to be lugging a newborn up and down the stairs, especially while still getting up in the middle of the night to nurse her. So, we bribed Garrett into moving his bedroom upstairs with promises of a Minecraft themed room (hello, Walmart posters) and put Caroline in the smaller bedroom on the main level. For two years she has had this dark little beige bedroom with nothing on the walls. It was pitiful. 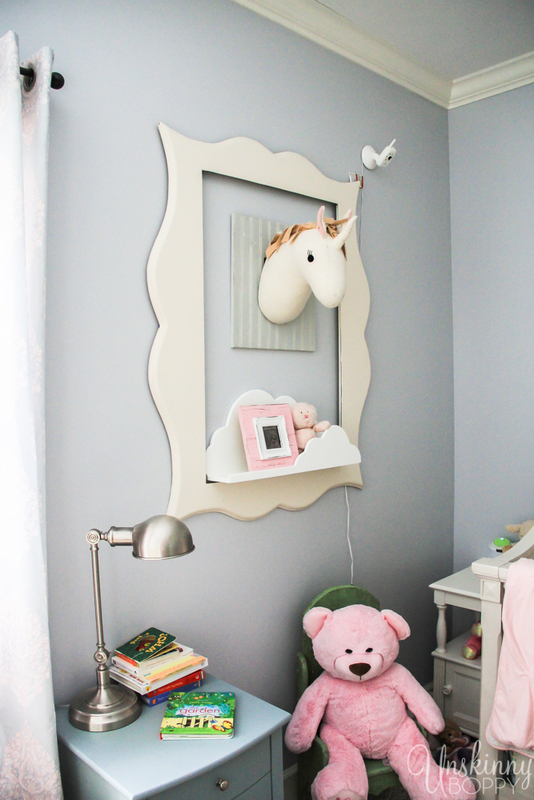 That FINALLY changed last week when I got her room decorated in a much more magical, unicorny, princessy fashion. 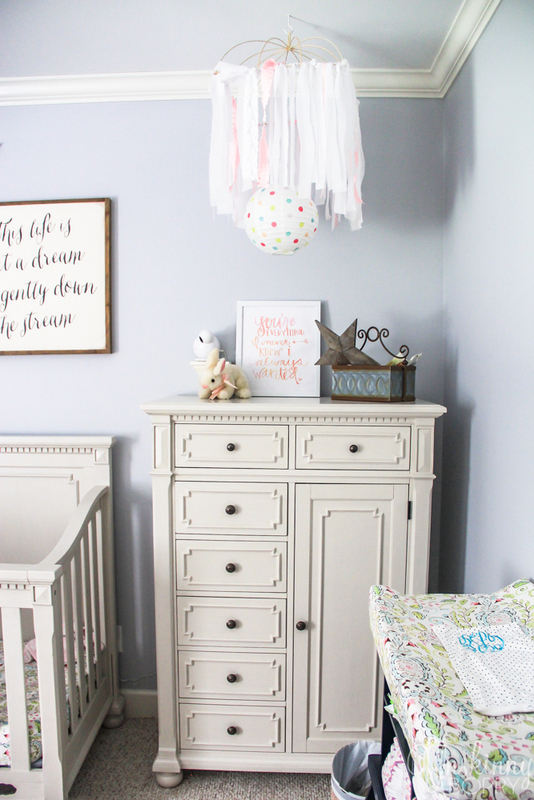 Luckily I still had enough leftover paint from the upstairs nursery to finish this room also. The paint color is Behr Marquee Manhattan Mist. 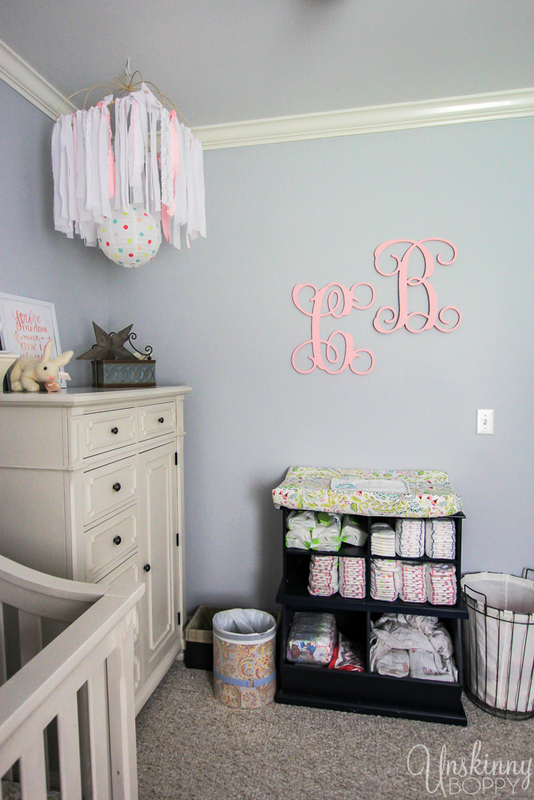 It’s a pretty bluish periwinkle color that could go either way for a girl or a boy. Gender neutral, I guess you’d say. When we finished the attic playroom I stole the big star from her old nursery to hang on the ceiling in there. I made other changes, though. 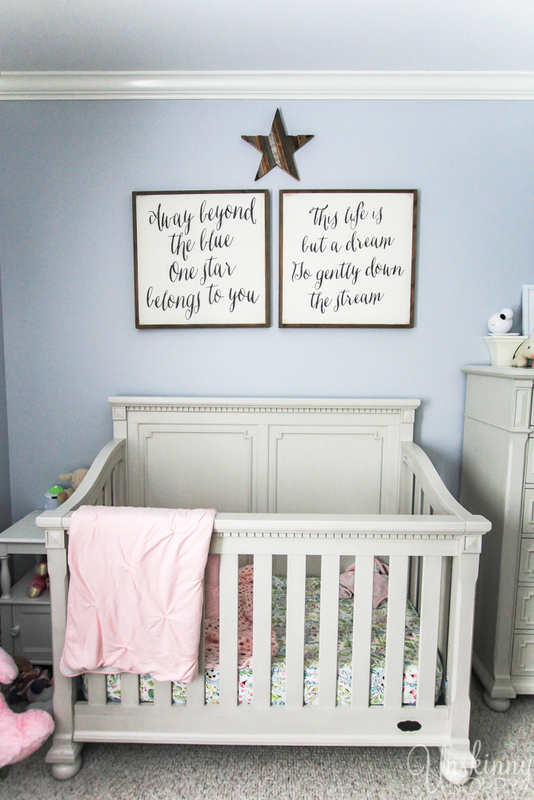 Specifically the artwork above her crib. 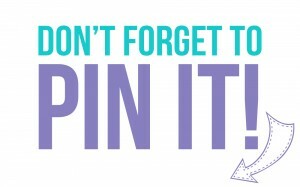 I tried unsuccessfully to DIY that scripted font on a board myself, but I was never happy with any of my attempts. Finally I sucked it up and ordered these from my friend Tara at Between You and Me Signs. They are perfect. I should have saved my efforts and ordered from Tara first. 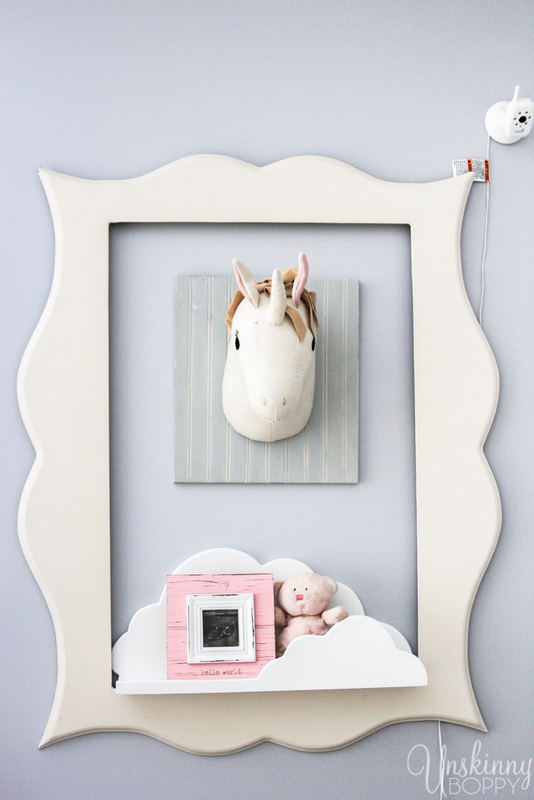 I bought this stuffed unicorn head at Target and totally broke my self-imposed rules of keeping her bedroom walls eye-ball free. Let’s hope they don’t freak her out as she gets older. 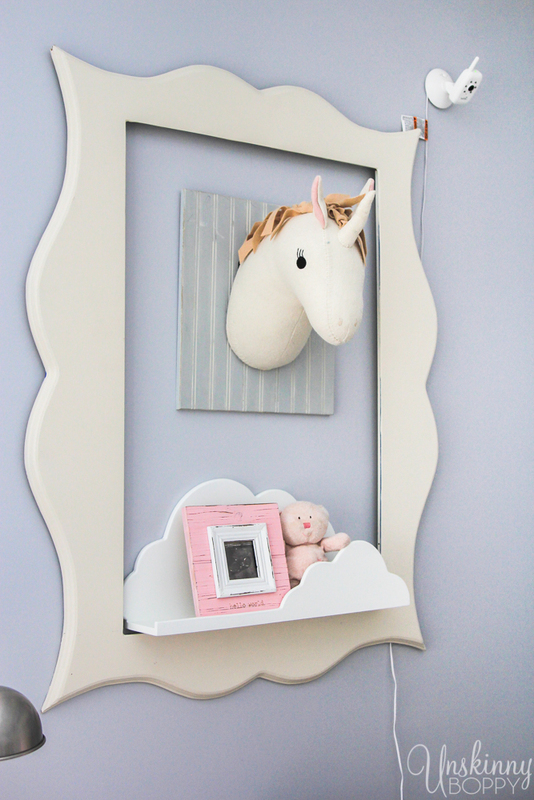 Instead of just tossing the unicorn up on the wall I decided to mount it on top of a beadboard picture frame so it stands out just a bit. I also added the Pillowfort cloud shelf below which also came from Target. The whole vignette got surrounded by my big ol’ funky picture frame that’s been around my decor for years. I’m happy with the way this pretty wall collage turned out. 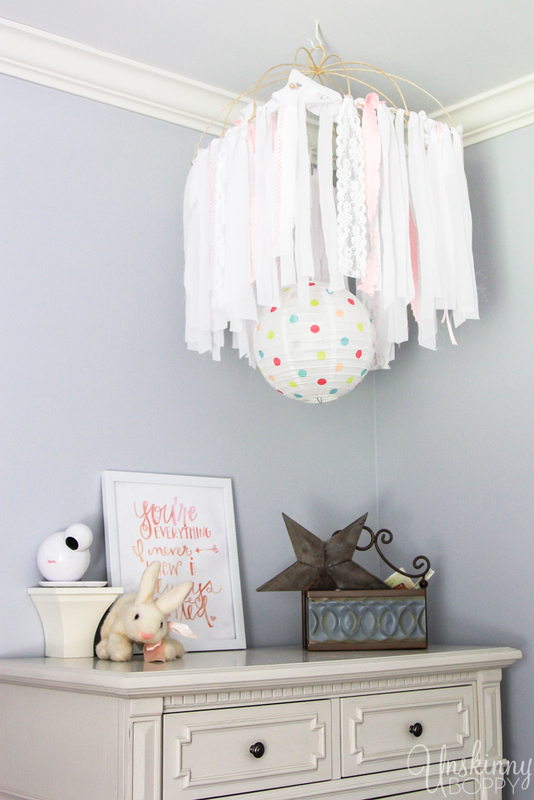 I’ve still got the DIY ribbon and lace mobile that I made hanging in one corner, but I added a little polka dot japanese lantern inside of it for some extra color. 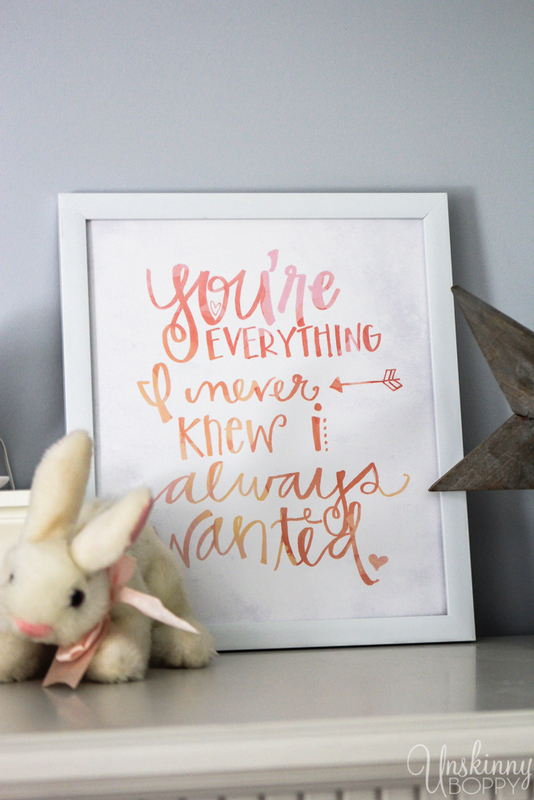 This sign came from Hobby Lobby, and it’s sooo applicable to this little girl in our lives. She is everything we never knew we always wanted. Over on the other side of the room I am using Garrett’s old toy chest as a changing table. 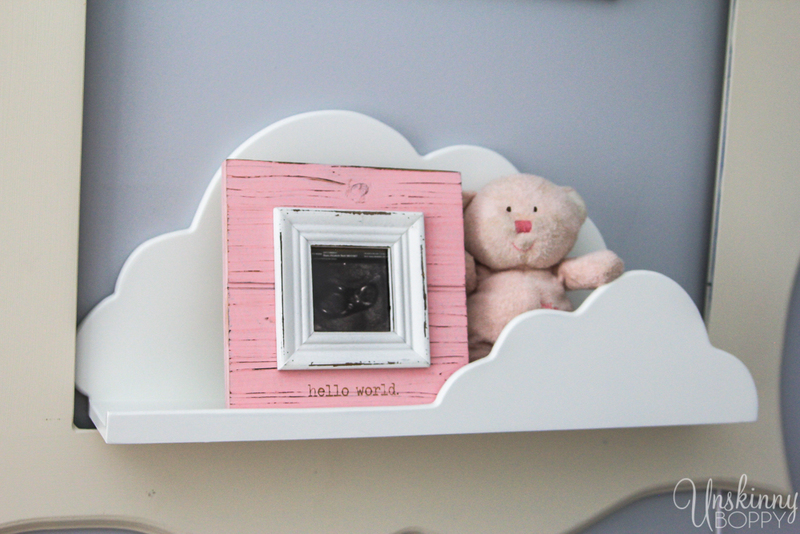 It works perfectly because it’s the right height and it has lots of little shelves for diapers and wipes and blankets. It’s a dark blue color, so I’d really like to paint it one day but I’m just too tired to care at this point. It’s functional and that is what matters most. I used a piece of non-skid drawer liner underneath the changing pad to keep it from slipping and sliding around. It works great. On the other wall is a bookshelf filled to up with books and shoes and a few toys. All of her toys live up in the playroom now so we don’t have to deal with them inside her bedroom. Shoes, books and hairbows make up the majority of the clutter so it’s not too bad. 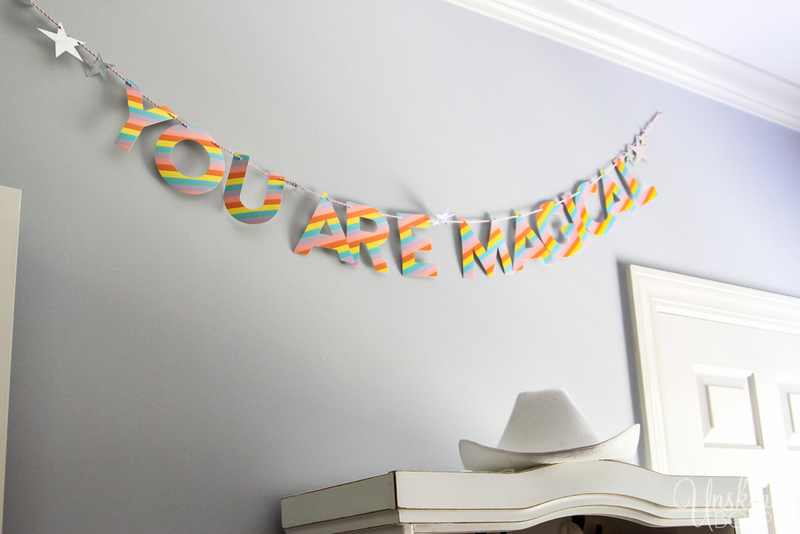 This little “You are Magical” banner also came from the Target party supply section. 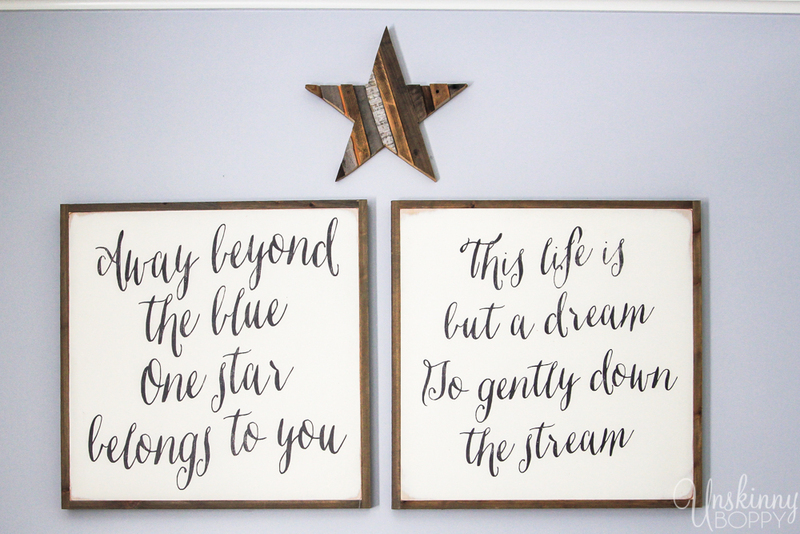 Nothing too hard about this nursery decor. I love the way this little room turned out. It’s perfect for her at this stage of life and it’s nice to have her on the same level of the house as us. 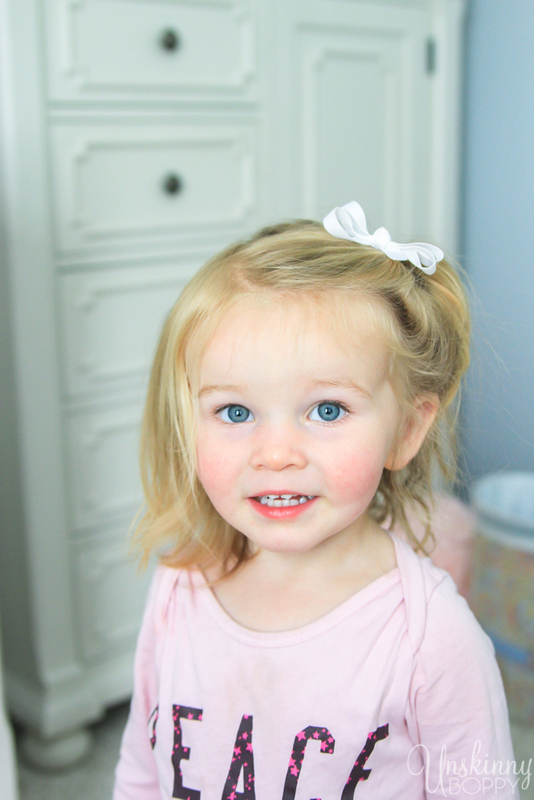 She turns two in August (WHAT!?!) Time flies, huh. We had a little impromptu photo shoot to celebrate the fact that I actually hung some things on the wall. Here’s my sweet girl with her naptime bedhead. Maybe when she’s older she will move upstairs but for now I don’t have to worry about her jumping over the balcony in the middle of the night. She likes to be on the go and she has become a little escape artist lately so I might have to put a chain-lock on the door to the garage to keep her from sneaking out. When she finally settles down, though, she soothes herself by sucking this one finger. 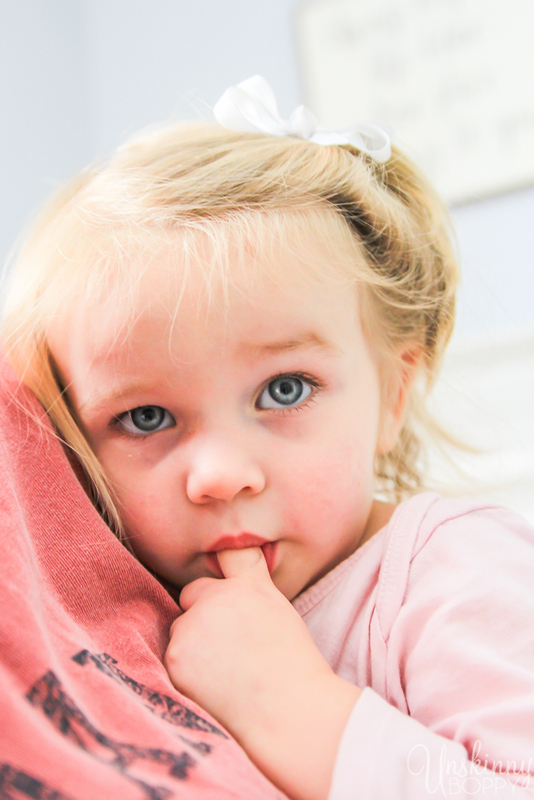 It is like a permanent pacifier attached to her hand. I am trying to decide if I should make her stop sucking it or just let her keep soothing herself with it. For now, she can put herself back to sleep so I am not gonna complain about that. I love this precious girl so much. There are times when I feel like my heart might burst from happiness just looking at my two kids. 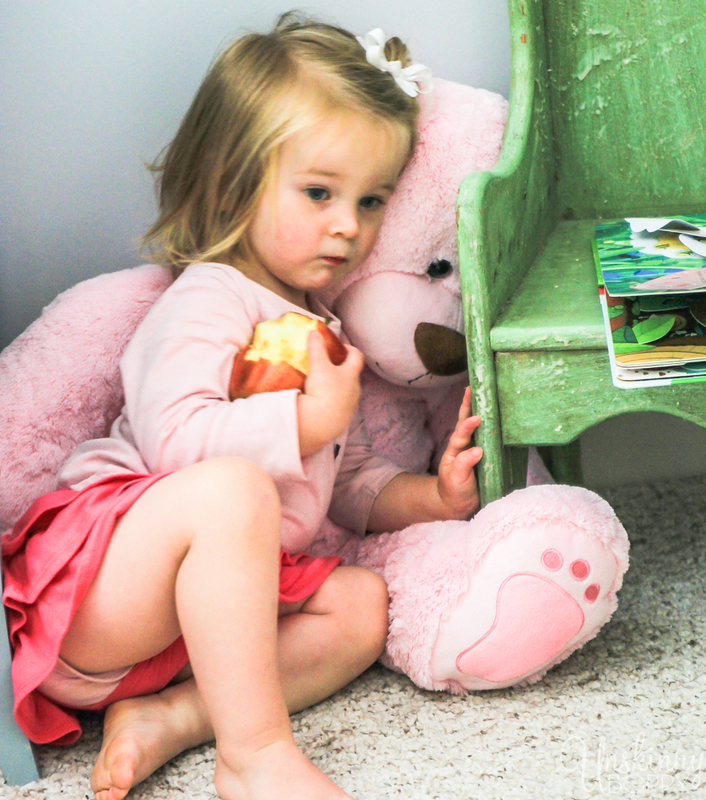 I never thought I would have a daughter, but here she is, in her magical little unicorn bedroom, with an apple in one hand and a teddy bear in the other. God is good. 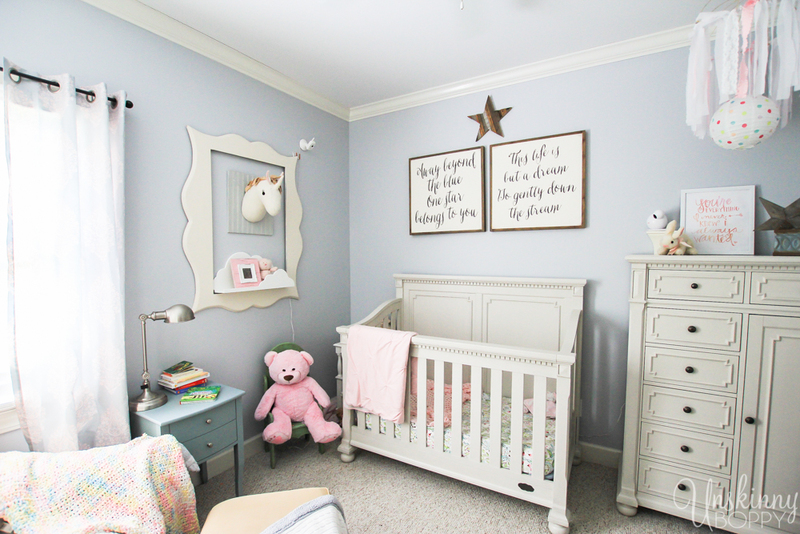 The nursery cute, but the true beauty in the pictures is your daughter! 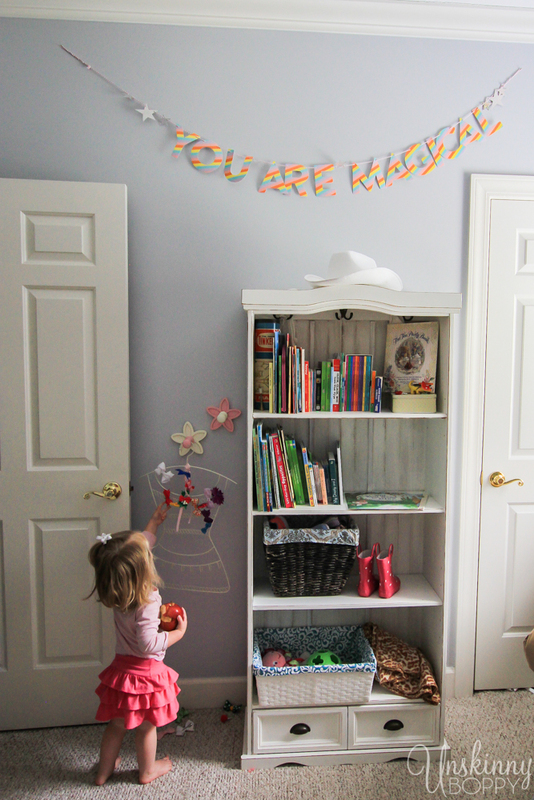 I’m glad you got her room finished before her 2nd birthday! Your ending is perfect…God is good! OMG! Your daughter is absolutely beautiful! I can see the next top model coming up and the next top decorator working themselves up the professional ladder! 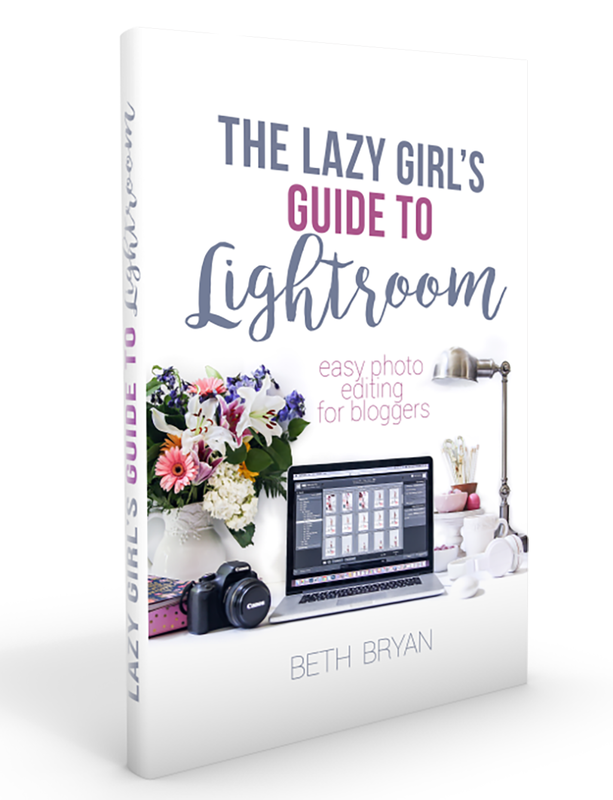 Great job Beth! I love every room you touch!! 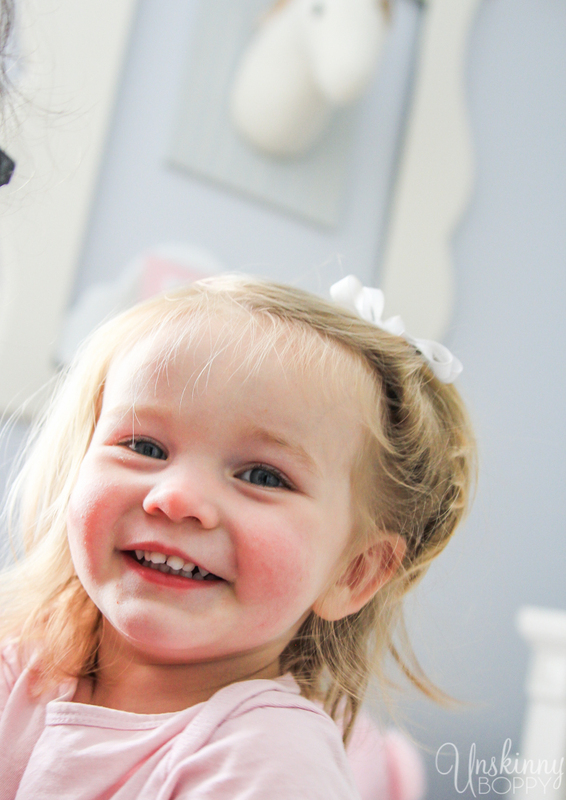 Beautiful little girl and beautiful nurseries! 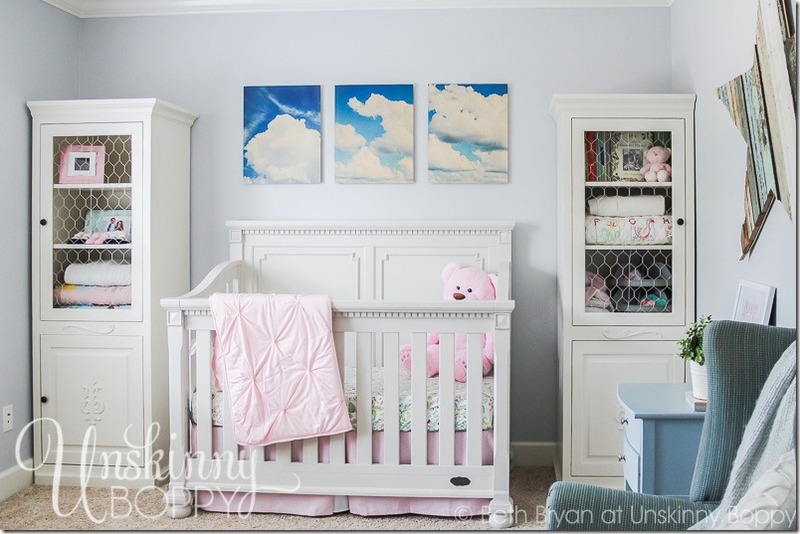 Where did you get the bookcases on either side of the crib in the first picture of this post? She is so precious. Enjoy her because they grow up way to fast! I found your comment about the chain on the door hilarious, because I was remembering stories about when I was little. My parents were really just kids with me. My mama was barely 20, and my daddy was also 20. They said at 7 months, I just stood up and started running and never slowed down! Don’t hate on them, but they finally resorted to tying me in the baby bed until they decided moving me into a full-size bed was safer. It’s probably no wonder they waited nearly 11 years to have my sister!! Thanks for sharing your ideas and the love you have for your beautiful children. God is truly good!